Post-Conflict and ICTs: Coverage, Stupidity or What Else? Many countries are using information and communication technologies (ICTs) in their government organisations. In the current geopolitical situation of some world regions, there are emerging challenges related to situations of post-conflict. These situations often involve the reintegration of ex-combatant and victim groups to the economic, cultural and social spheres of life. How to ensure adequate appropriation and empowerment of these groups via ICTs involves a complex set of issues to address by different actors. The tip of the iceberg for ICT experts and policy makers is the legacy of initiatives whose initial aims were to transform societies into citizen-centred ones. In post-conflict situations, a transition to citizenship by the above groups requires thinking of long-term measures to first re-establishing a sense of belonging to society and secondly restoring trust in government organisations. Developing countries could have advanced in rolling out communications, telephone and internet networks to several geographical areas. They could have made available online many services and platforms to organisations and citizens. But have they tackled the root causes that led people to become marginalised in the first place? Are the methods promoting participative decision making inclusive of people and their concerns for a better life together? In 2007 I became interested in the evaluation of e-government in Colombia and wanted to explore how this phenomenon was pervading government organisations at national, regional and local level(s) of decision making and what opportunities could be discerned to enhance citizens’ participation. After some interviews and analyses during 2007 and 2011, it became clear to me that e-government was in need of adopting a more systemic view of how the use of ICTs is conceived of, planned and implemented (Córdoba-Pachón and Orr, 2009; Córdoba-Pachón, 2014, 2015). There are opportunities for citizens’ participation which could be enhanced by enabling the purposes of ICT to be openly discussed and if necessary reformulated before any policy or investment is finalised. A systemic view of e-government required also to explore if and how citizens’ participation (does not) take place so that the causes of their (un) willingness to appropriate and feel empowered by ICTs could be identified and addressed. These could be basic problems of access to public services, corruption or economic marginalisation. In 2016, the Colombian Government had already envisaged a clear direction for the role of information and communication technologies (ICTs) to support post-conflict. According to a newspaper article in El Tiempo, ICTs were seen as fundamental to improve among other sectors the business, agricultural and educational. Education in the use of ICTs as well as through ICTs for ex-combatants and victims is to be contracted with public and private institutions. Also, according to El Espectador, competitions for ideas for digital products are being sponsored or funded by the Colombian National Department for Science, Technology and Innovation. Still, legacy thinking about ICTs could be reinforced. Investments on coverage, service penetration and achievement of measurable service goals seem to benefit government at the potential expense of marginalised groups. It is still assumed that they are to become users and that they somehow are ‘stupid’ and subordinated to experts (Rose, 2003). Centralisation, coverage and standardisation seem to privilege a market-oriented view of populations. Alternative views about the role(s) of ICTs to support post-conflict are needed. These could be developed collaboratively by different political actors. The support of academics would be to enable them to design meaningful and holistic plans to enable inclusive reintegration both locally and in relation to what happens elsewhere. In this regard, systems methodologies and creativity ideas could offer some support for stakeholders to work together and be supported rather than directed by ICT experts or policy makers. 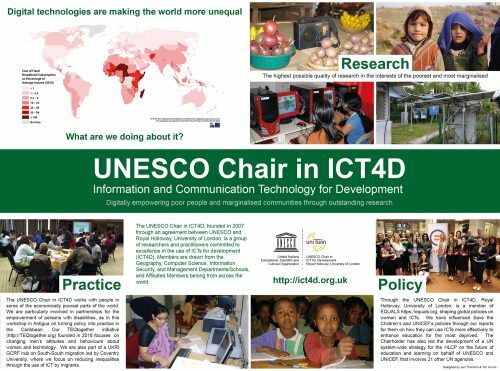 The door is open for ICT4D researchers and practitioners to venture to involved or influenced by the UNESCO chair explore the multifarious complexities of post-conflict situations in the global arena and provide adequate thinking and practice to benefit the most vulnerable. Posted on July 30, 2017 July 30, 2017 by Endrit KromidhaPosted in ICT4D BriefingsTagged citizens, coverage, ICT, opportunity, Post-conflict.